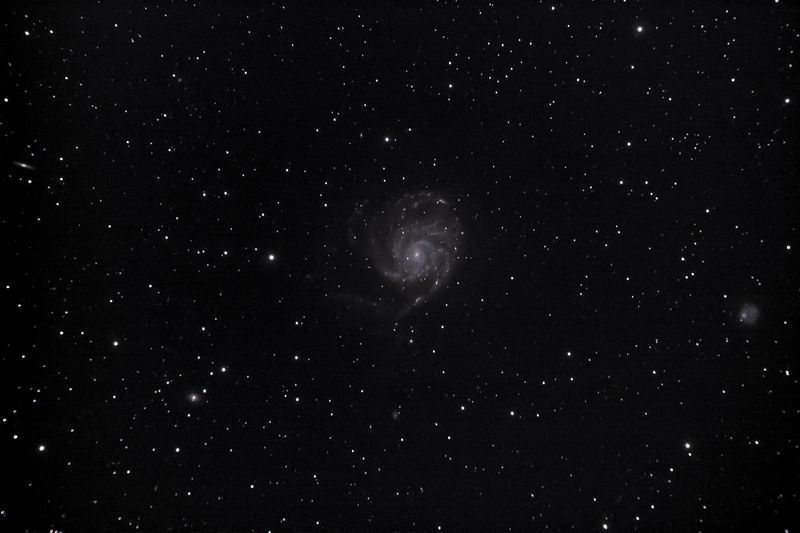 This is a reprocess of previous data on M101 taken back in 2014. It consists of 1hr 35mins of data in 4m exposures at ISO 800 with the modified 1100D and Astronomik CLS filter, taken through my Starwave 102ED. I restacked with MaximDL rather than using Deep Sky Stacker, and then finished off in Photoshop and Lightroom. I’ve recently been pushing for more naturalistic looking images, and trying not to overprocess. Hi Adam, is it my eyes or do you see a bit of drift in the star field? I tried to spot the galaxies that are not so obvious. that’s when I thought i saw the elongated stars. So the question is if the stars are elongated, is it the post processing or is it there from the captures? Thanks. I dont think its drift, at least not much… However, the big chip of the DSLR combined with the non-flattened field of the 102ED meant that moving towards the corners, the stars become slightly elongated in the direction of the corners. This data was captured about three years ago now I think – since then I’ve got a flattener for the 102ED. There may be the tiniest bit of drift near the centre, but this was also before I belt-modded the HEQ5, so my guiding wasn’t as reliable as it is now.